During the early years of UNICEF’s existence, raising funds and awareness of children’s plight was of paramount importance. 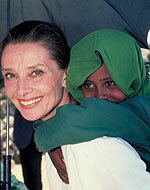 Many talented individuals were drawn to UNICEF’s cause at that time. Danny Kaye, a famous US actor and comedian, was possibly the best known of these early advocates. Danny’s recruitment was the result of a chance encounter with then Executive Director Maurice Pate aboard a flight from London to New York. The plane caught fire in mid-Atlantic and, in the hours while it made its way back to Ireland for repairs, Maurice Pate spoke to Danny Kaye about UNICEF. 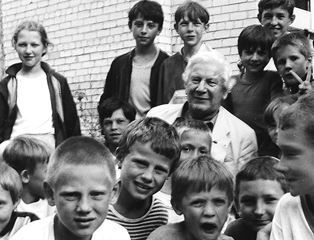 Danny Kaye without hesitation volunteered to work for UNICEF then and there, and became UNICEF’s first “Ambassador-at-Large”, traveling around the world. He subsequently made a 20-minute documentary film, “Assignment Children”, that was seen by more than 100 million people making UNICEF a household name worldwide. Sir Peter Ustinov, Liv Ullmann and Audrey Hepburn followed in his footsteps. Other distinguished artists have continued to contribute their talent and time to the organization. Current Goodwill Ambassadors.